MUNSTER’S TOMMY O’DONNELL says the returning Lions couldn’t come at a better time after the province had their pride bruised in defeat last weekend. Munster were soundly beaten by Glasgow Warriors in Scotstoun and O’Donnell admits that an unacceptable lack of physicality had a big impact on the team. But with a rejuvenated Pater O’Mahony already taking control of the team in his first week back, O’Donnell thinks they will soon be back on the right track against Cardiff Blues. “It will be good to welcome those lads back when they do hit the field. When they hit the field they bring confidence and experience and hopefully now they’ll bring what they’ve learned from the Lions tour and bring a bit of freshness with them as well, that they’ll up the vibe again and give us the presence that we’re used to on the field,” said O’Donnell. “I think the way he (O’Mahony) is talking in meetings, it’s like he’s reassessed his view. He’s bringing a whole view of the game and how we’re playing so it’s definitely worked well for him. 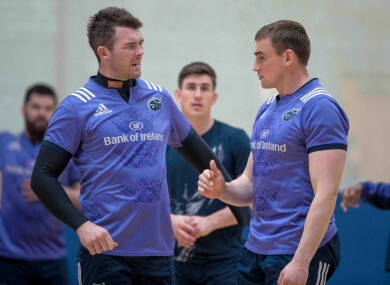 The likely comebacks for O’Mahony, Conor Murray and CJ Stander is a boost for the team, but with Jack O’Donoghue and Sean O’Connor doubts due to injuries sustained last weekend, back rows O’Mahony and Stander are most welcome. The trio will likely face their former Munster teammate Nick Williams, who was instrumental in Cardiff’s win in Galway last Saturday. And O’Donnell knows all about his power and bulk. “We’ve been bouncing off him now in different jerseys over the few years,” O’Donnell said of the former Ulster 8. “I remember him one day, it was an A game and he took out this brand new pair of boots and I just looked at his feet and I said ‘they are not going to fit into those boots’ but he did. “Aidan O’Connell spotted me and said to me ‘you couldn’t stop staring at him when he put his boots on’ and that just shows how big a man he is. I didn’t think these new boots were going to allow this massive man’s feet into them. But he did. “Nick is a good player and a hard man to stop if he gets going. Defensively he’s a momentum killer, if you come around the corner and he hits you square he’s going to stop you. “Cardiff are a tough team like that. They’ve got a lot of experience, a lot guys who have been around the block and played a lot of professional games. Email “Lions lessons evident in returning Peter O'Mahony, says Tommy O'Donnell”. Feedback on “Lions lessons evident in returning Peter O'Mahony, says Tommy O'Donnell”.